Things that I treasure in my life and the treasures I create around the house and in my world of crafting. WIP Wednesday - Update - a Finish! Since I don't have anything to show that I've progressed greatly on lately, and I'm waiting 'til the end of the month to show you my "bonus finishes" for February's 12 in 2012...I'll show you a WIP Wednesday featured here that I never showed you finished! 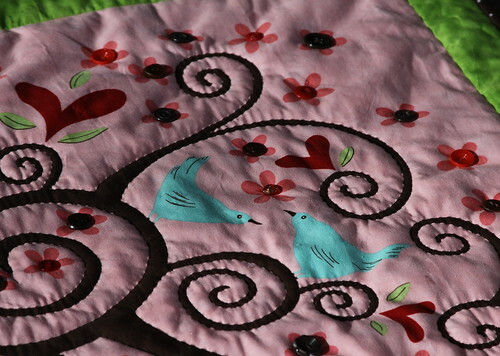 Back in July, I featured a piece that I was hand-quilting here. Well, it is finished! Well, it has been finished since just before Thanksgiving, but I never came back to show you. So - here it is! 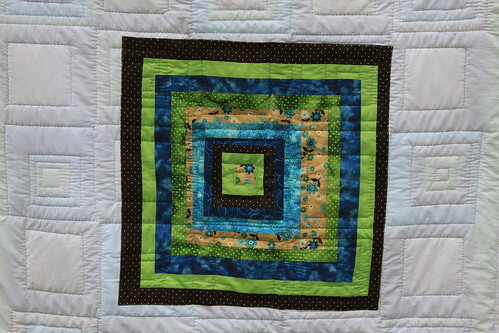 Although you can't really tell, I hand-quilted around each of the front squares with coordinating thread, so the back is filled with these squares of different colors. 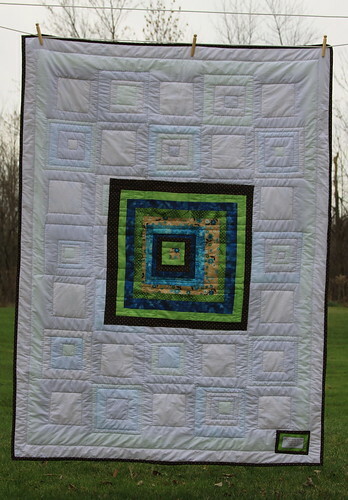 Although I can't claim it as a 2012 finish - it is the first quilt I finished completely for myself, so I wanted to show it off. Size-wise it is around a full, so it will make a great couch quilt and bedrunner size folded at the bottom of the guest bed, which will be its permanent home. If we ever get back to working on *that* room again! So, to keep on with my 12 in 2012 updates, I've finished February's projects. 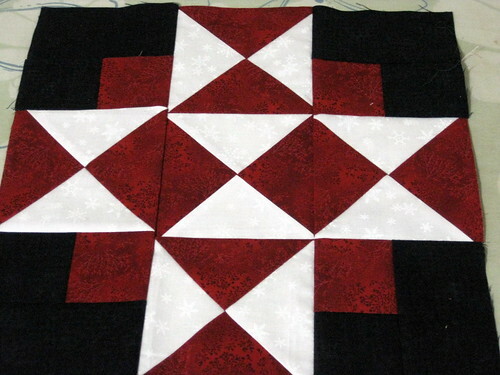 I had already finished the one birthday_block that was due in February, it was Cari's black and red and white block request that I chose to do a Four Corners block for. The other part of February was a Valentine's Wall Hanging for the house. This is based on a panel that I've had forever and just hadn't gotten around to. I've never really been a panel person, but I really liked this one, so bought it during an online shop hop. 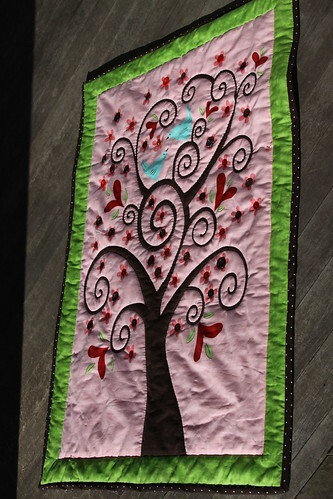 Around last August I had most of it hand quilted (I outlined the tree), but then it sat stagnant for a while. One of the things I had inherited over time was a collection of antique buttons. Kept in Mason and Ball jars with bail type lids, I had spent a lot of last summer and early fall sorting them by color and cleaning them. So, maybe I had buttons on the mind, but I thought the wall-hanging was in need of something. So....buttons! I went through the buttons I had and grabbed the red and brown ones I thought would work and attached them. Now it looked complete. All it needed now was binding. Luckily I had some left over from my Modern Squares Quilt. And it's finished. Although the brown polka dot binding doesn't match exactly, I think it looks pretty good! Now that it's been gifted, I can share my January finish. But, before I share, a little back story. I have known Val for...11 years now. We met when she was 16 or so and still in High School and I was 21 and finished with my undergraduate degree and had moved back home. I started an informal group of writers that met a couple times a month locally to read their own and each others' poetry and such. I was instantly struck by this quiet, polite young woman who reminded me very much of myself at her age and felt very maternally towards her. Part of me always will. After a while of writer's group meeting, Brian started to come around because he had met Val through another one of her passions, Ultimate Frisbee. 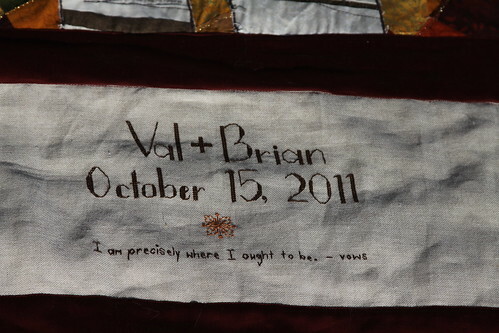 Long story short, Brian and Val started dating and got married this past October. When Val asked me to be a bridesmaid for her wedding I was instantly honored and very touched. I knew I wanted to make her something very special for her wedding. Which was totally beautiful and fall themed. From the "unity volcano" to the carved pumpkins and herb centerpieces, the wedding was completely reflective of Val and Brian and the crazy-beautiful love they share. Fall and crazy-beautiful love led me to imagine two birch trees (one of their favorite trees) on a fall background of leaves, to look like two white trees in a fall forest. Often when I start creating something from scratch (anything really, it doesn't matter the medium), finished size is not something that comes into my thought process early. Much like I think I remember Stephen King saying about writing books, it kind of has "a life of it's own and tells me what it's going to be like in the end.". So, I started with the trees and then pieced the entire background in my "faux-crazy-quilted" technique. 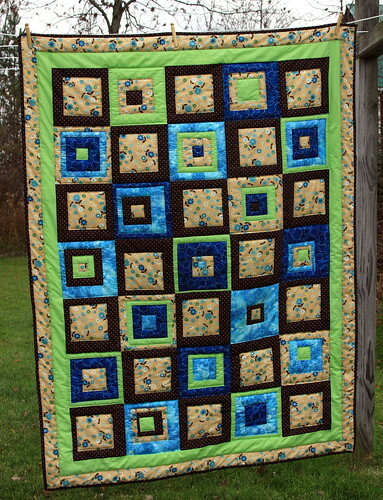 It is kind of a combination between a whack-n-stack and a crazy quilt. 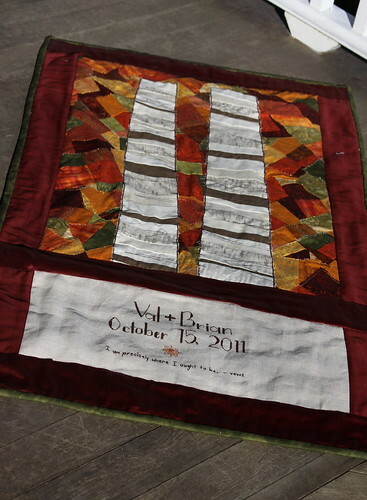 After I had the main part pieced it came to me how it wanted to be finished. 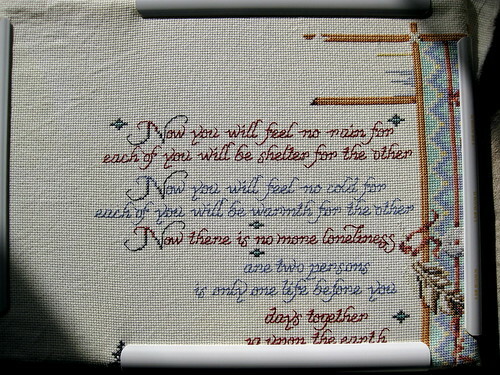 It needed some cross-stitching to add their names, date and wouldn't a quote from the vows they wrote themselves be perfect. So, I harassed them while they were on their honeymoon in New Zealand and they got back to me with the line, "I am precisely where I ought to be". Which is perfect and sums them up so elegantly. And here it is. All finished and gifted and hopefully I'll have a picture of it hanging in their apartment some day to share with you all. But they love it - and that's all that matters. 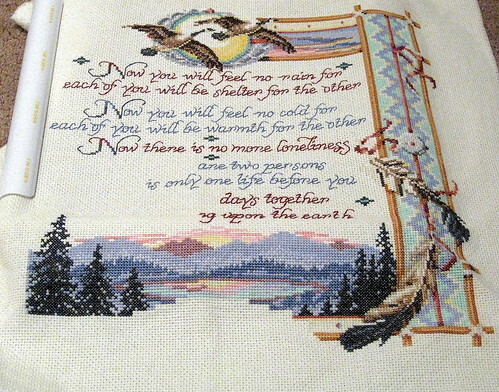 So, over on LJ in the cross_stitch community, the moderators have been cheering us on for WIP Wednesday since there hasn't been a stitching Olympics/World Cup in a while. Since I finished the Polar Bears, that meant that the Apache Wedding Blessing could move up in the rotation. Not too much there, two sides done and some words. The center top medallion is about done. Forever ago I totally re-charted the top of the border so there wasn't a medallion thing where the top ribbon is, so when I get to the other side I'm going to have to do something similar. I also have the bottom border to work on, so I think after the center top medallion, I will move to the center bottom and then start working my way up the other side. Although this isn't one of my 12 for 2012 projects, I'm really excited that I'm making progress on so many things! Look back this weekend to see 12 for 2012 progress and the latest Mystery Present! All recipes and patterns (c) Amanda McFaul 2010-2012. Watermark theme. Powered by Blogger.